Are you ready to move into the second half of your life? Bob Buford believes the second half of your life can be better than the first. Much better. But first, you need time to figure out what you want to do with the rest of your life. In Halftime, Buford focuses on this important time of transition--the time when, as he says, a person moves beyond the first half of the game of life. It's halftime, a time of revitalization and for catching a new vision for living the second half, the half where life can be lived at its most rewarding. As Buford explains, "My passion is to multiply all that God has given me, and in the process, give it back." 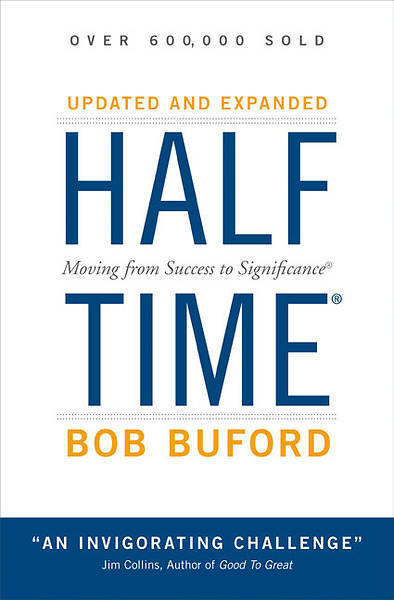 Features of this newly updated and expanded edition include a foreword by Jim Collins, the bestselling author of Good to Great; new questions for reflection or discussion at the end of each chapter; brand new "halftime" stories of men and women enjoying a second half of significance; specific halftime assignments to guide readers into their second-half mission; an essay by Bob on "The Wisdom of Peter Drucker"; a special update from the author on how the halftime movement is growing nationally, and links to outstanding resources. Midlife. Halftime. It doesn't have to be a time of crisis. It can be a catalyst for purpose, impact, and growth. Bob Buford provides the encouragement and insight to propel your life on a new course away from mere success to true significance--and the best years of your life.